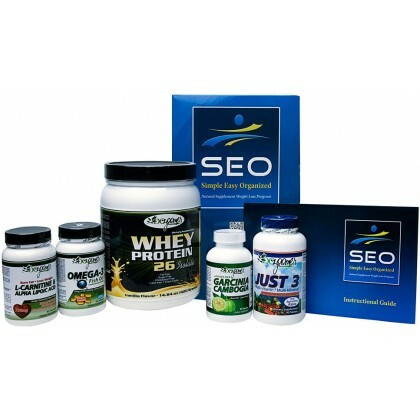 SEO Natural Supplement Weight Loss Program is here! Most people that have struggled with weight have been doing so for years. They have tried everything but it just doesn’t work long term. As you get older, keeping weight off is even harder because of slowing metabolism, loss in muscle mass and a decline in hormones cause your body to store more fat. An obese person’s life span is up to 10 years shorter than that of someone of average weight. Even more alarming is the fact that more than 80 percent of all cases of type 2 diabetes are related to weight. One out of every three cancer deaths is linked to excess body weight, physical inactivity or poor nutrition. Did you know that your risk of dying prematurely increases even if you’re just 10 pounds overweight? SIMPLE is the most used word when it comes to defining the start of a perfect weight loss program. We can’t tell you how many people when surveyed said that they want a weight loss program that is simple to use. EASY is a must. With our busy schedules and even as we all know that exercise is very important many just can’t or won’t find the time. Sometimes you just can’t get motivated. There has never been a supplement package such as this that has been proven to make a difference in your life. These natural supplements help your body work the way it is intended to. We are not giving you a daily recipe guide because that will drive you crazy. But we gave you some ideas along with helpful hints. Each supplement is explained what it is, what is does and how it will work for you. EASY You can even visit links of some of the supplements being called the Holy Grail of weight loss by a popular television health care program Dr. Oz. ORGANIZED We did it for you. Just do the same thing every day. Take the supplements as recommended daily. No tracking every calorie, no weighing your food. Just try to do this: Cut back or eliminate processed foods, eat more fish and whole grains, eat fruit and vegetables when possible, use Olive Oil or Sunflower Oil, NO vegetable or corn oil. And drink plenty of water. Research shows that, in men, short sleep led to a spike in levels of the hormone ghrelin, which stimulates hunger. In women, short sleep reduced the hormone (GLP-1) that makes you feel full. So, getting too-few hours of sleep had different effects on men (increased appetite) and women (reduced feelings of fullness), but with the same result: a tendency toward overeating. The obvious solution is to try to get enough sleep. Lastly, exercise is great, and important, but you may be able to lose weight by not changing anything that you’re doing now. We only ask you to please read all enclosed material first. It’s important to know why these supplements work, how much to take and when to take them. You become the expert of managing your body with knowledge. Note: This weight loss program is meant to be an addition to your regularly scheduled meals. Remember, you don’t lose weight by not eating, as frequent meals enhance your metabolism. Included is our Whey Protein-26 Isolate as part of your natural weight loss plan. Protein is a nutrient that the body needs to grow and maintain itself. Next to water, protein is the most plentiful substance in our bodies. Just about everyone knows that muscles are made of protein and muscle helps increase metabolism. Actually, every single cell in the body has some protein. In addition, other important parts of the body like hair, skin, eyes, and body organs are all made from protein. Proteins are made from simpler substances called amino acids. The role of the essential amino acid leuchine is to improve body composition. High quality whey protein is rich in leucine to help preserve lean muscle tissue while promoting fat loss. A three way combination of great supplements starting with L-Carnitine and Omega-3 fish oil, is one of the simplest things you can do to lose weight, and raise your energy levels. Fat loss and more energy are two of the unique benefits. Carnitine is a potent fat burner because it transports fats into the cells to be used for energy in the body. By raising Carnitine in your muscles, you support fat burning and also increase your energy because you are becoming more efficient in processing fuel. For L-Carnitine to work- you must have adequate levels of Omega-3 fish oils in the body. To get Carnitine into your muscles it has to be accompanied by insulin. If you get enough good Omega-3 fats into your cells then they become more sensitive to insulin which allows more energy from Carnitine. Omega-3 with L-Carnitine will allow fat to come off. Omega-3 increases your metabolic rate by increasing cell activity and fat burning. By elevating L-Carnitine, fat burning increases. Acetyl-L-Carnitine is a powerful antioxidant that can detoxify the brain of heavy metals especially when paired with Alpha Lipoic Acid (ALA). Alpha Lipoic Acid is a great antioxidant that not only fuels the brain and gives you energy, but a wonderful supplement for fat loss and a treatment for obesity and diabetes. ALA has a potent effect on metabolism and as long as it’s taken with L-Carnitine and Omega-3 fish oil. We pride ourselves on representing supplements that can make a difference in your life. Supplements in our opinion that work and offer health benefits as well. We did research on Garcinia Cambogia Extract and found it to be amazing to say the least. The Dr. Oz show called Garcinia Cambogia Extract the Holy Grail of Weight Loss. The extract derived from the Garcinia Cambogia fruit rind contains Hydroxycitric Acid (HCA), which is thought to work as an appetite suppressant and fat burner. Hydroxycitric Acid (HCA) is thought to block the enzyme that keeps carbohydrates from turning into fat. Pure green coffee bean extract has made big news in the media for its weight loss properties. It is a powerful antioxidant derived from an unroasted coffee bean. In fact, all coffee starts as a little green bean. The ingredient responsible for the weight loss is a compound found in the green coffee bean named chlorogenic acid. A recent episode of Dr. Oz, a popular doctor’s TV talk show, featured the benefits of green coffee bean extract. Amazing research shows that this dietary supplement may help people lose weight without changing their daily routine. There is really no such thing as a complete 1 per day formulation—they usually lack sufficient levels of key nutrients, complex vitamins and important minerals such as calcium and magnesium. Just 3 is simply that, one of the most complete 3 per day formulas on the market providing a high potency blend of vitamins and minerals along with a complete food based complex including fruit and vegetable blends and spirulina. This program is Simple, Easy and Organized because that’s what you want it to be. SEO Natural Weight Loss Program - Simple, Easy and Organized defines our Natural Supplement Weight Loss Program. Sign Up for Valuable News and Discounts and Receive 10% OFF Your First Order Today! Our company strives to make a difference in our client’s lives through a private line of vitamins and supplements carefully chosen for the particular benefit of those age 40 and over. Our devices for Chiropractic wellness are unique and well received throughout the industry. We will always be sensitive and respectful to our customer's needs, providing reliable service, honest information and standing behind the products that we represent. We interact with our guests through Social Media like Facebook, Twitter; Instagram, Google ad words and informing and entertaining through our Newsletter. We welcome feedback as a means to shorten the distance between us and our worldwide customer base. We will continue to offer a price/quality relationship throughout our product mix and supply our clients with education as they shop and to over deliver after the purchase.